Want to have some fun? Come to Friends of Murphy Library’s Arts & Crafts & Craft Supplies Sale this Thursday & Friday, July 16 & 17 from 9 to 5, and Saturday, July 18 from 9 to 1! What is black and white and red, pink, blue, turquoise and fuchsia all over? 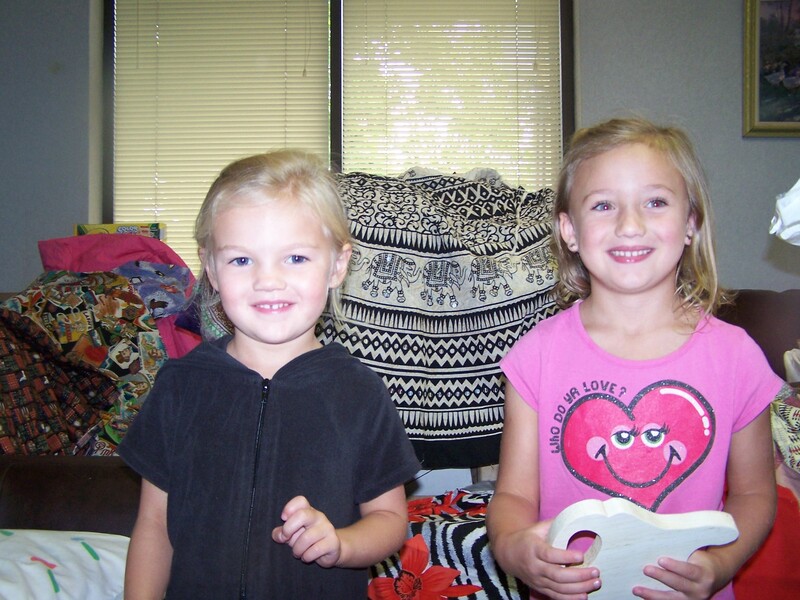 Cousins Vivian and Chloe McNabb can tell you – it’s the Arts & Crafts and Craft Supplies Sale this Thursday and Friday from 9 a.m. to 5 p.m. and Saturday from 9 a.m. to 1 p.m. at the Murphy Library! There will also be a Book Sale and Home Repair Sale in the back breezeway. During a visit to “Storytime” at the Murphy Library, 5-year-old Vivian, daughter of Becca and Lawrence McNabb and 4-year-old Chloe daughter of Paige and Evan McNabb visited the library’s back room full of colorful fabrics, paints, glass stains, stamping and scrapbook items, yarn and lots more. Local crafts people Renate Craig, Sammie Simpson, Sharon Francis, Vivian Schell, Jan Ruiz, Jo-Anne Allen, Bobbie Allen, Margie King and Lois Lenz will sell their finished crafts and supplies during the three-day sale. And the Friends will sell loads of beautiful donated craft supplies. Demos will be given on Friday and Saturday covering scrapbooks, memory books for photos, box making, border cutting, hand-quilting, stamping, and maintaining a sewing machine. Sammie Simpson will also offer the sewing machine demo on Thursday. 10: 30 a.m. and 1:30 p.m.
12:00 Sharon Francis demos the Gift Box Punch Board. Make 15 different size boxes with self-closures using only a square sheet of paper. No gluing or cutting needed. 12:30 Ronney Craig demonstrates the Creative Memories border maker and its versatility for scrap booking and card making. There are many different cartridges for different borders. A quick and easy tool for lots of variety! 1:00 p.m. Sharon Francis demos Project Life by Stampin’ Up, a memory keeping book taking only minutes to assemble. Pre-printed, cut to size cards in two sizes with various page layouts can be ready when photos arrive. No more shoe boxes of pictures with this easy, fun way to share your memories. 1:30 p.m. Sammie Simpson will teach “The Care and Feeding of Vintage Sewing Machine” – bring her your questions – she knows how to maintain a machine. 2:00 p.m. Sharon Francis demos Paper Pumpkin, a 30-minute paper crafting kit in a box that includes everything you need to make cute simple projects. Each month this cute orange box shows up in your mail. 2:30 p.m. Ronney Craig will demonstrate the Shape Maker System. See how a circle, a square, puzzle piece, and circle tag can turn into fun embellishments for cards, scrapbooks, and other items. 10:00 p.m. Ronney Craig will demonstrate the Shape Maker System. See how a circle, a square, puzzle piece, and circle tag can turn into fun embellishments for cards, scrapbooks, and other items. 10:30 Sharon Francis will demo the Gift Box Punch Board. Make 15 different size boxes with self-closures using only a square sheet of paper. No gluing or cutting needed. 11:00 Ronney Craig will demonstrate the Creative Memories border maker and its versatility for scrap booking and card making. There are many different cartridges for different borders. A quick and easy tool for lots of variety! 11:30 Sharon Francis demos Project Life by Stampin’ Up, a memory keeping book taking only minutes to assemble. Pre-printed, cut to size cards in two sizes with various page layouts can be ready when photos arrive.